Nogal is similar to Black Walnut only much darker in appearance, and it is more uniformly colored. Other than that Nogal is almost identical to Black Walnut, only it’s larger and more black than its American cousin. Nogal is found all over South and Central America and is commonly used as a substitute for Wenge. Like all walnuts, its grain patterns can range from wildly figured as shown in this photo to a mostly straight pattern. We try to select the most figured stock to make our dice from. Wish I had some regular dice to base this off of for example. The flat can help but hard to tell the difference when actually made. See one that is made to compare this to but none made for this to do that. we are working to get all of the woods photographed in dice form. 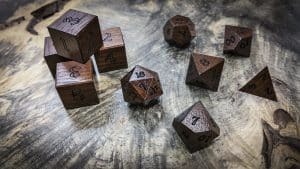 Hey, I was interested in ordering a more expensive dice set on kickstart, was looking at the 100.00 druid wood ones. Since the kickstart is closed, please tell me how I can go about doing that. there are a ton of woods you can buy right now from the website. we will have the rest of them added to the site shortly.